If you haven't had a chance to check out the post yet @acidyo is giving away a pretty massive delegation for those that are able to guess the price of Steem on January 1st, 2020. I thought it would be interesting to take a look at the values that have been commented so far. What initially made me curious is I have trouble converting Satoshi to BTC values and BTC values to Satoshi and was wondering if others did as well with any clear outliers. The data from here on out is assuming I didn't make a typo when converting everything over into Excel. If you see any errors let me know so that I can get them fixed. The highest BTC price that was predicted was $113,428.32 and the lowest was $1013.95. The average price of BTC was about $16,000, but if you remove some of the "outliers" the average is around $8,000. I considered anything that was greater than $17,000 to be an outlier as you can see from the below graph and didn't use any statistical method. My initial hypothesis was the BTC value was going to be a lot more varied than it actually was since you weren't actually guessing the BTC price directly. Either people are a lot better at understanding the difference when converting from Satoshi to BTC than I thought they were (which wouldn't be too surprising considering this is a crypto platform) or most people assume that the price will remain pretty flat for the rest of 2019 as well and just did some sort of multiple of current prices. 83% of the people that commented think the price of Steem is going to end the year at under $4. 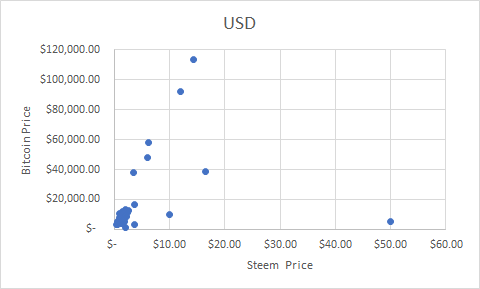 The highest USD price for Steem was $50 and the lowest was $0.35. 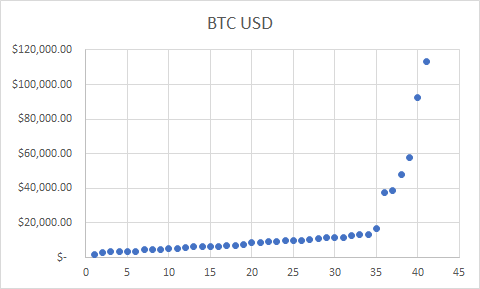 I will say the person that guessed the lowest USD price bet that both the USD and the current BTC price will increase by about 28% between now and the end of the year, and unless something drastically changes between now and then (huge spike or drop in BTC price) this could be the closest numbers. 90% of the people believe that Steem will stay under 45,000 Satoshi. 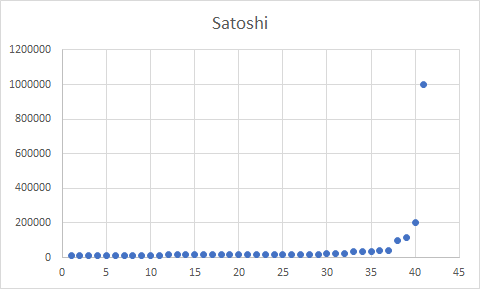 The lowest Satoshi guess is 9391 and the highest Satoshi guess was 0.01 BTC or 1,000,000 Satoshi. Another interesting thing to note is that the highest Satoshi price guess has the highest USD price as well, but has an almost average BTC price ($5,000) indicating that they think Steem will gain a lot of strength compared to the BTC market. 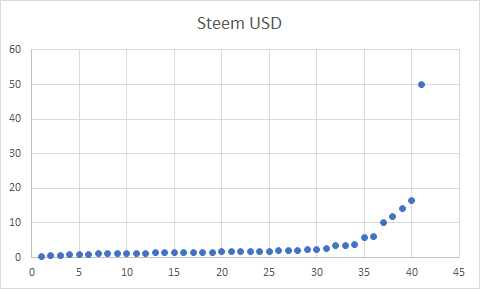 To put matters into perspective they think the USD price of bitcoin will go up 60% and the USD price of Steem will go up more than 100x in price. This is the prediction I'm most rooting for. The biggest take away I got from the numbers is that most people think that the bottom is here or we have already reached the bottom and the recovery will start before the end of the year as no one guessed a Satoshi nor a USD value lower than current prices. I almost want to change my guess now and guess a lower number than the current ones. This also makes me somewhat bullish on Steem as a whole. While you have some people that are very optimistic, most people that are still active on the platform are bullish on the future of Steem. In hindsight, it does make since that most people that are bearish have either left or no longer active, but it is also nice to see some reasonsably realistic expectations and not just guesses or comments that Steem is going to the moon. @maarnio wins the award for most hopium guess for Steem as he guessed the largest in both USD and Satoshi. @rayken04 wins the "flat as a pancake award" for being the person that is thinking no match will ultimately change in prices from now until the end of the year (regardless of the action in between). @wolfhart is definitely the optimist and wins the award for biggest BTC bull as his guess assumes the price of BTC will be $113,428.32 @worldtraveller32 wins BTC biggest bear with the lowest BTC price of $1,013.95 @itstime wins the copycat award for being the only commenter to guess the exact same thing as someone else. Finally, I'll include one more chart that I think has some relevance. The higher the dot is, but remains closer to the left-hand side means that those people are saying that Bitcoin will grow faster than Steem. The farther to the right and the closer to the bottom is that Steem is more bullish than Bitcoin. The closer to a 45-degree growth is saying that the overall crypto market will grow together. Looks like people are more bullish on Bitcoin either consciously or subconsciously, then they are on Steem. Let me know your thoughts in the comments down below. Are the conclusions I'm drawings the same that you're seeing or am I way off in my thoughts?